Belgian photographed collapsing spire of Notre-Dame: The picture of my life. One of the most published photographs of the devastating fire in the Parisian Notre-Dame cathedral, where the spire of the tower collapses. The photo is of Belgian origin. Press photographer Geoffroy Van der Hasselt (33) from Waterloo for five years as an independent press photographer in the French capital. He did his story to La Dernière Heure, the newspaper where he once did an internship. 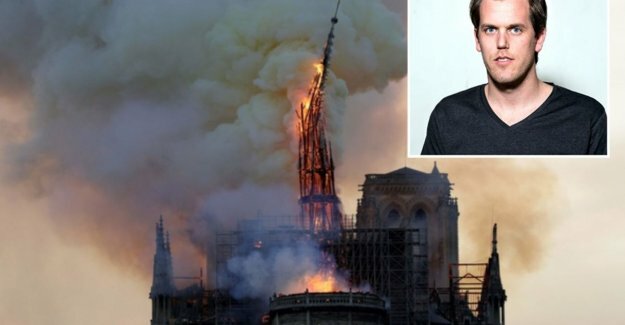 Geoffroy was Monday evening around 19 pm, a call by the fotodesk of Agence France Presse (AFP), after the Associated Press (AP) and Reuters derdegrootste news agency in the world. AFP apparently had all of the available photographers to the cathedral sent. More photographers on the spot to send was necessary. AFP spoke, displaying their freelance network. They arrived at Geoffroy. The thirties going to the door, not without his photographs. He crawled right on his scooter and cut his way through the Parisian traffic. From the Bastille, about three kilometres further on, he could the smoke, see. Once on the spot were a lot of spectators already in the back with their smartphones to create images. In contrast to them, if Geoffroy, as the holder of a French press card or come closer. He looked for a place and went to work. After about 20 minutes he heard by bystanders cries of dismay. The roof of the nave had gone. “I realized that the structure of wood existed. So, it would not take a long time before the spire would collapse. From then on, I concentrated fully on the burning striker at the moment,” says the photographer. “Of course it is very unfortunate that it is such a dramatic event, but it really is the picture of my life,” he continues. The photo kicked it to the cover of a lot of French and Belgian newspapers, and also made the front page of The New York Times and The Wall Street Journal.